moyhu: USHCN, adjustments, averages, getting it right. Ironically, much of the discussion recently has been a replay of the debate we were having back when the whole "march of the thermometers" meme was being debunked. 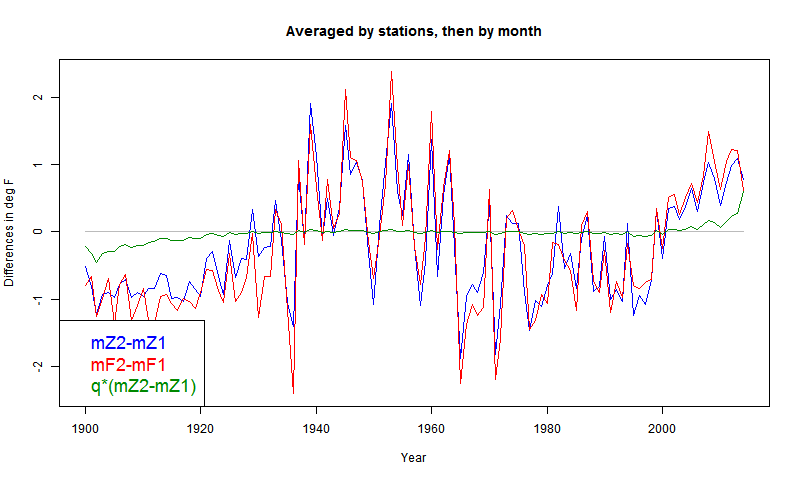 If you use absolute temperatures and your station network composition is changing over time, you will tend to get climatology-related artifacts that are comparable in magnitude to any trend effects you are looking for. I've been curious about why USHCN produces an absolute temperature. I presume there is history there. I believe they treat pre-1931 differently because, I gather, when they took over from state dominant arrangements in 1931, some things were hard to change. But still, 1931? It does seem to cause a lot of trouble, and I wonder how many people really want to know that it was 54°F in the USA. Yes, but that's climatology. We had maps like that in our school atlas. But who needs to know the US average temperature? I think you're right that there may be pressure from parts of fed etc, which probably predates paying days. But I'm still puzzled. That's a great explanation of the spike. Thanks! 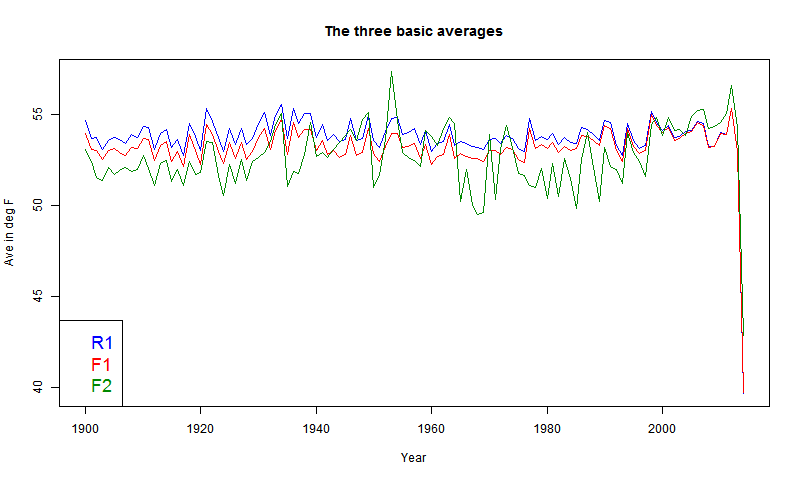 From time to time reference is made to trend or lack of trend in numbers of record high (or low) temperatures. This reference is a part of the Line of Evidence by which a group of meteorologists sought to counter US government evidence used in a Supreme Court Case involving our EPA. I would think it possible to have increasing numbers of record highs in a climate with descending mean temperatures and if that is possible, then little significance should attach to increased record numbers. Am I missing something here? FWIW that would require substantial regional changes in climate (climatology) which might be possible in a continental nation such as the US, but not very possible. The focus on records seems to be a particularly US thing. I think it's an understandable measure in some ways, being not affected by TOBS etc. But it is dependent on the reliability of old measuring; errors tend to become records. And it is dependent on the history of stations. What if the hottest place in your state is discontinued (or a new station there)? Also I think they accept records from flakier sources. But if all that turns out OK, then I think there should be increasing new records. 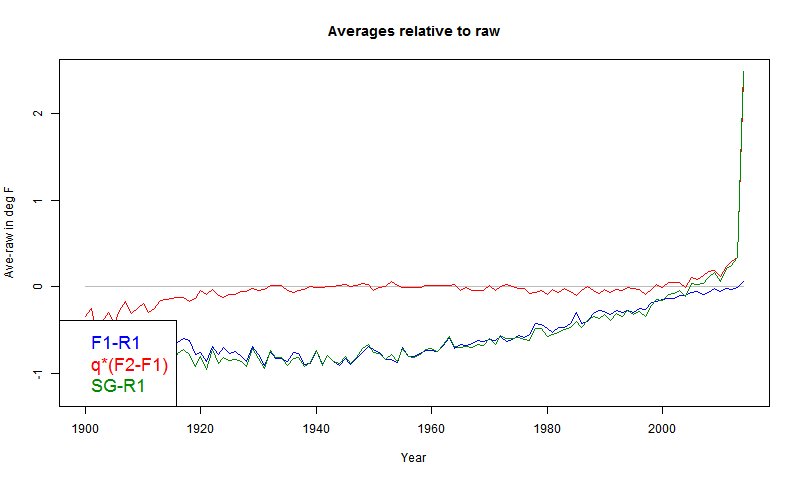 I did a study of hot times in my home town here. Eli, could you expand a bit on your point? I don't understand what you are driving at. 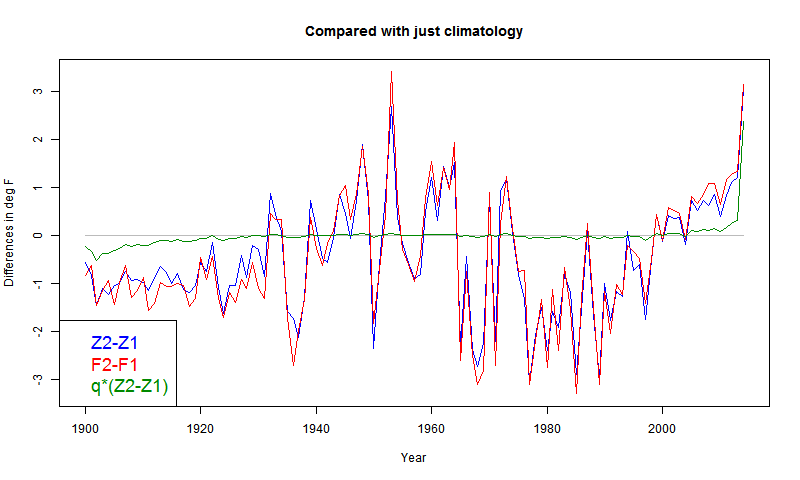 I may have been confusing tortoise and hare (sorry) with climate characteristics and have no dog in the race, but the thing I was trying to get at, is whether there is intellectual authority behind the notion that increasing numbers of high temp records indicates general warming. I concede that it is likely, but are we certain? Nick, I like the OBS observation where the record is trapped by the sliders in the thermometers and it matters not which day it happened on. I do think that we in the US are now highly "extreme" driven. I wouldn't at all be surprised that a word frequency count of the all of the evening news programs would produce a much higher number now than ten years ago - and maybe the occasional "record" too. "Extreme" would be the word counted in convoluted comment above. 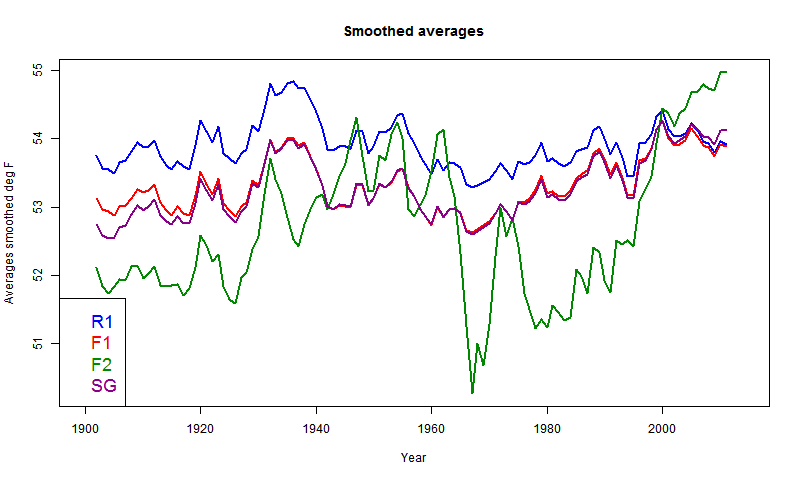 Nick, do you have your colors mixed up in the figure "smoothed averages"? If the deviation between F1 and F2 is so large something is funny in the adjustments. F2 is the average of the set of final values where there is no corresponding raw. From about 1920 to 1990 that was a very small set, so the average wanders. It is multiplied by a small p, so doesn't matter very much. I think at the ends it reflects the biases I am trying to illustrate. Spectacularly in 2014, because of April having many missing and being warmer than rest of 2014 so far. But in other years, I think from other biases. It probably mostly means missing values are more common in winter. 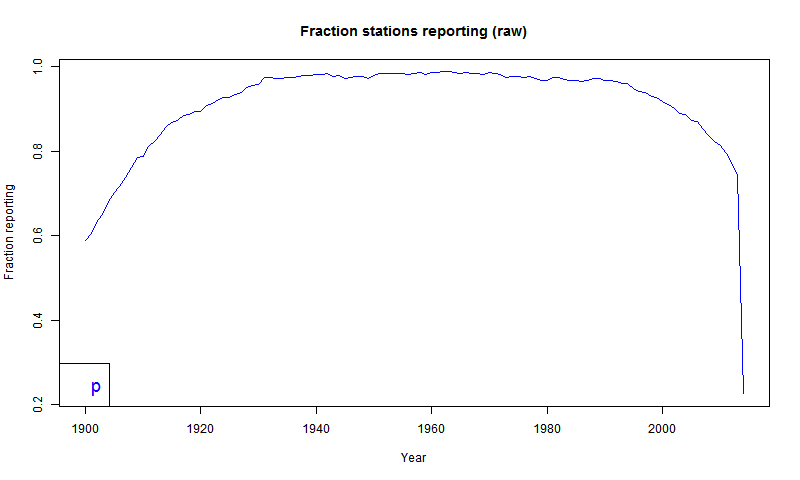 There may also be a bias in where stations dropped out after 1990.